The administration presided over by Donald Trump gave a new step in the confrontation with Russia last Friday, including in its list of economic and financial sanctions seven oligarchs to punish Moscow for interfering in the 2016 elections. This has caused some Russian companies to collapse on the stock market and resulted into headlines all over the world. The Russian stock market collapsed this Monday morning because of the sanctions introduced by the United States against several Russian companies and businessmen. This is the biggest drop in the MOEX index (former Micex, denominated in rubles) since January 2016, close to 9.2%. The ruble also weakened by 0.9% against the dollar, reaching 59.9 rubles per dollar by two in the afternoon (local time). 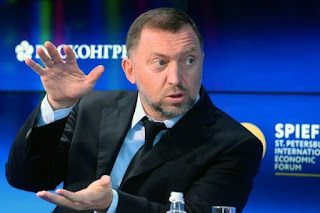 The company hit the hardest was Rusal - giant of the aluminum industry that controls one of the sanctioned, tycoon Oleg Deripaska - whose shares fell about 50% on the Moscow stock exchange (in Hong Kong also lost half of its value). The collapse occurred after the firm admitted in a statement that due to the sanctions, it could fall into technical defaults with respect to some of its financial commitments. Also, the document indicated that it was very likely that the sanctions would negatively influence "the business and the prospects" of the same. At the end of 2017, Rusal had debts of about 8,500 million dollars, which due to sanctions, will no longer be able to refinance in Western banks. Deripaska controls about 48.13% of Rusal's shares and 66% of En +, which also suffered a strong downtrend, losing 22.8% of its value. Washington imposed sanctions on Friday against 7 Russian billionaires (Vladimir Bogdanov, Deripaska, Suleiman Kerimov, Igor Rotenberg, Kiril Shamalov, Andrey Skoch and Viktor Vekselberg), and 17 officials close to the Kremlin. Among the most important sanctioned companies, in addition to Rusal, figures Rosoboronoexport, which is dedicated to the export of armaments. Moscow has promised, through the voice of Deputy Prime Minister Arkady Dvorkovich, to help the companies of the sanctioned. «There will be support for each case; if your situation worsens, we will provide it and we have already studied some measures", said Dvorkovich. Meanwhile, the Central Bank set the official rates for Tuesday at 57.8332 rubles to the dollar and 70.7070 euros, which represents a fall of 1.26% compared to the first and 1.64% compared to the second. As we notice, the global economy is in a dangerous situation because of the instability generated with the greatest powers. Let us remember that by mid-March, the Treasury Department announced the imposition of sanctions on 19 citizens and 5 Russian companies both for their participation in the manufacture and dissemination of fake news (bulletins) during the 2016 election campaign and for an orchestrated series of cyber-attacks against key sectors of the economy.